Barn Bowl and Bistro opened nine months ago. The owners of the new bowling alley in Oak Bluffs want to change zoning on an adjoining residential property to allow for added commercial development. Oak Bluffs town administrator Robert Whritenour told the selectmen last week that he had received a last-minute request from the owners of the Barn Bowl and Bistro to place an article on the annual town meeting warrant; the draft article seeks to change the zoning at 3 Uncas avenue from residential to commercial. 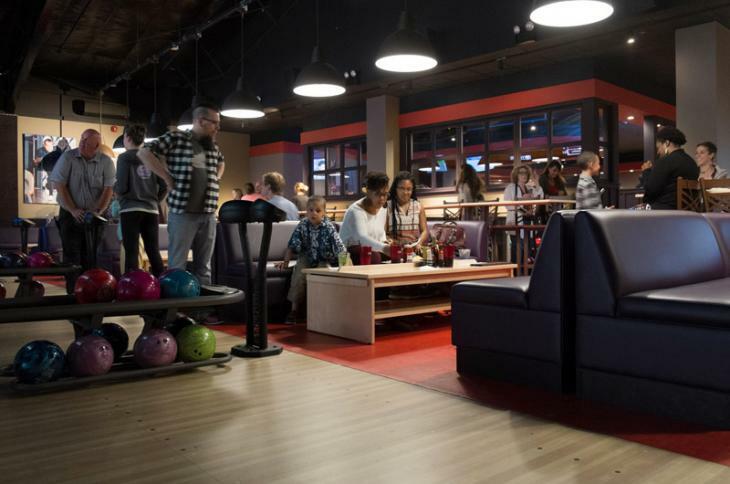 The bowling alley, which opened in May 2015, is located at 13 Uncas avenue. The area is surrounded by residential neighborhood. Two years ago when the bowling alley project was under review by the town and the Martha’s Vineyard Commission, a number of neighbors registered concerns about noise and possible encroachment on the residential area from a commercial establishment. In a letter to the town last week, Barn and Bistro owner Robert Sawyer urged quick action by the town on the request. The letter came as the annual town meeting warrant was closing. Selectmen agreed to refer the matter to the town planning board. According to land records, 3 Uncas avenue last changed hands in October when it was bought by Joseph Stewart Jr. for $475,200. A single family home sits on the .17-acre property. Beautiful inside and out, a great example of follow through on their proposal, uplifting property values all around. Nice to see people actually come through with what was promised. Creates good faith. The interior is outstanding...somebody got the design and colors right. Long time, year round Islanders Giving a long term contribution to MV. Congratulations Sawyers! If by "follow[ing] through on their proposal" and "come[ing] through with what was promised" you mean pulling a last minute switcheroo and saving themselves a few hundred grand by subbing a sewer hookup which needlessly gobbles up capacity that could be used to save dying ponds then, yeah, great follow through on the initial plans. I for one do not have "good faith". DITTO. Judge a person not on what he says but on what he does. Actions speak louder than words. I told you, I told you, I told you --- Robert Sawyer involved, Hold On folks!! Sawyer said plans for the property have not been fully developed. “We’re not sure, we have no plans for the property,” he said. “We’re not even giving it a moment’s thought until we get the commercial zoning. There is nothing on the table.” BULL, BULL, BULL! ............. No Plans RIGHT! "Sawyer urged quick action by the town on the request". Mr. Sawyer also made is own access road onto Lambert's Cove so he not travel down the speed bump subdivision rd. Bob likes his own way!! He pulled stuff in VH sorry OB hopefully you will put him in his place. Now you know why Sawyer pulled this sneaky move in OB, VH is very familiar with him and his shenanigans here so he had to choose elsewhere. This is the same person who LIED in my opinion when he said he would do his own septic system on his property and the pushed to be tied into town system. His place represented about 125 - 150 homes that could and would have been connected along Lagoon and County Road. He already has crushed the sign regulations on size and how many he way allowed to have on his eye sore in my opinion. He has lied and will continue to do so to BS everyone in my opinion. I concur! Perhaps in this instance Atlas would be better served if he joined the Conservation Commission, Zoning Committee or some such group rather than shrugging? Shouldn't you wait until the seasonal stakeholders are back in their homes? I think the town should seriously consider this request. The Barn Bowl & Bistro has been a huge positive addition to the entire island! The area was depressed until these guys worked their magic....give them a chance to do it again. Actually the town worked their magic allowing the septic hook up. Everyone knew the composting crap wasnt going to work. Pure Greed. Nothing is ever enough. It will be the end of us. Mr Sawyer might want to take a few moments and read Steve Jobs letter, written as he lay dying, and Mr. Jobs thoughts on amassing wealth and where it stands in life's bigger picture. The Barn, Bowl & Bistro has had such a positive impact to the island community. It is what the island has needed for nearly two decades. The leagues are great and really create a sense of community among island residents. Everyone that I know of who has gone there, loves it!